Elise’s Drop Sugar Cookies – Hermitage TN | Bush Insurance & Financial Services, Inc.
It’s time to think ahead to Holiday celebrations! The Bush family loves to gather from all around Nashville and celebrate the holidays together. We each have our own things we like to make for the celebrations, and for the younger ones in the family, it’s all about the sweets! Here’s a simple recipe for great sugar cookies from the Bush family. 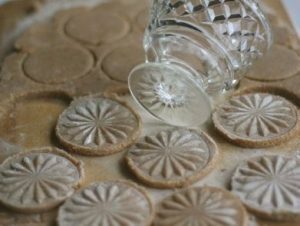 We like to press a pretty glass into the sugar cookies to create a design before adding sprinkles or sugar.. Cream butter and sugar together with an electric mixer. Beat in egg and vanilla. On low speed, beat in flour mixture, mixing only until all flour incorporated. Refrigerate dough 1-2 hours. Bake 8-12 minutes at 350 degrees F.
The Chilling Truth About Frozen Pipe Claims – And Ways to Avoid Them Your Insurance Agent Wants You to Give These Christmas Gifts!